Allow quick and easy pumping to 60psi for mountain bike and 120psi for road bike. Built-in hose protects your valve stem while tightly threaded onto the valve with no leaks. and you can easily tighten the nozzle onto valve and pump with no leaks. We offer 100% SATISFACTION GUARANTEE and TWO YEAR WARRANTY. Please feel free to contact us with any issues, we provide refund or free replacement for all manufacture defects. Compact & Metal Body:The Pump is 8.27 inches long,and weighs 7.8 ounces,easy to store.It adopts aluminum material for long-lasting performance.Compact & Metal Body:The Pump is 8.27 inches long,and weighs 7.8 ounces,easy to store.It adopts aluminum material for long-lasting performance. High Pressure & Quick Pumping:160psi / 11bar offers quick pumping for mountain or road bikes. Making it efficient inflates on each push and pull for maximum air volume & faster tire inflation. Presta And Schrader Compatible:Fits both Presta and Schrader valves without any leaking!There is not need to change the valve or use any adapters.Simply unscrew the valve and replace. Flexible hose can be twisted a full 360°. What You Get :Includes mounting bracket,velcro strap,patch kit and needle nozzle.It works for all kinds of bike. Also applied for basketball, soccer, football, life-buoy and air balloons. 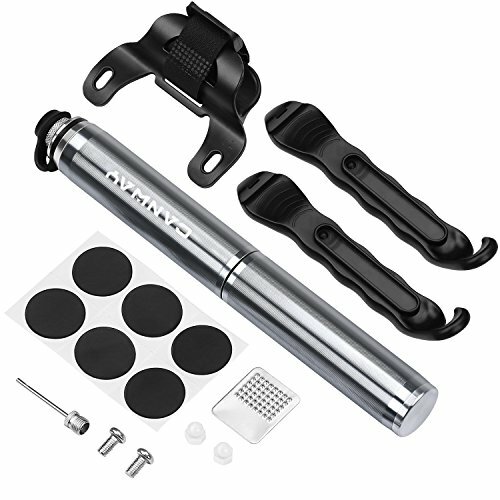 Buy With 100% Confidence:We have confidence that you will love this portable bike pump,and gurantee 2 years protection for free from the date of its original purchase. If you have any questions about this product by Canway, contact us by completing and submitting the form below. If you are looking for a specif part number, please include it with your message.